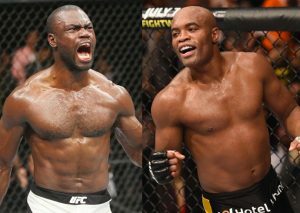 RIO DE JANEIRO, BRAZIL – After organizers stated they could not find an opponent in time to face Anderson Silva on the UFC 198 card in Curitiba, which takes place on May 14th at the Arena da Baixada, sources confirm the Brazilian will face Jamaican Uriah Hall, also known by the nickname “Ambulance Man,” for sending his opponents in the TUF 17 straight to the hospital. Jamaican Uriah Hall will face Brazilian legend Anderson Silva in UFC 198, image recreation. Initially the main event of UFC 198 was announced with Brazilian Fabricio Werdum making his first heavyweight title defense against American Stipe Miocic. As the co-main event, Ronaldo Jacare and Vitor Belfort (both Brazilian) fight at middleweight. So far the largest UFC event in Brazil has been the UFC 134 (UFC Rio 1) held in August 2011. That event took place in the HSBC Arena in Rio de Janeiro and drew 14,000 fans, featuring Anderson Silva, Maurício Shogun, the legend Rodrigo Minotauro. Giovanni Decker, president of the brand in Brazil, has been aiming to make the UFC 198 in Curitiba the biggest UFC event yet in Brazil. To date the event has popular names like Belfort, Nogueira and Maurício Shogun, who will be fighting in his home state (Curitiba is the capital of the Brazilian state of Paraná). Now with Anderson “The Spider” Silva on the card, UFC 198 is set to be even more popular. Silva will fight Hall, a 31-year-old Jamaican athlete who has a record of twelve wins and six losses and was compared to Spider by spectacular knockouts. Born in São Paulo, Silva is now forty, but the former champion middleweight, considered one of the best fighters of all time, has a record of 33 wins, seven losses and one no result match. Yet he comes from big setback against Michael Bisping in the month past in London. Before that, Spider defeated Nick Diaz at UFC 183 in January 2015, in a fight that had its result changed to “No Contest”, after the two competitors were caught doping in a post-fight exam. Previous articleOpinion: Brazil’s Smoking Gun?